Nazi Germany or the Third Reich (German: Drittes Reich) wis the period in the history o Germany frae 1933 tae 1945, whan it wis a dictatorship unner the control o Adolf Hitler an the Nazi Pairty (NSDAP). Unner Hitler's rule, Germany wis transformed intae a fascist totalitarian state that controlled nearly aw aspects o life. Nazi Germany ceased tae exist efter the Allied Forces defeatit Germany in Mey 1945, endin Warld War II in Europe. Hitler wis appyntit Chancellor o Germany bi the Preses o the Weimar Republic Paul von Hindenburg on 30 Januar 1933. The Nazi Pairty then begoud tae eliminate aw poleetical opposition an consolidate its pouer. Hindenburg dee'd on 2 August 1934 an Hitler becam dictator o Germany bi mergin the offices an pouers o the Chancellery an Presidency. A naitional referendum held 19 August 1934 confirmed Hitler as sole Führer (leader) o Germany. Aw pouer wis centralised in Hitler's person an his wird becam abuin aw laws. The govrenment wis nae a coordinatit, co-operatin bouk, but a collection o factions strugglin for pouer an Hitler's favour. In the midst o the Great Depression, the Nazis restored economic stability an endit mass unemployment uisin hivy militar spendin an a mixed economy. Extensive public warks war undertaken, includin the construction o Autobahnen (motorweys). The return tae economic stability boostit the regime's popularity. Racism, especially antisemitism, wis a central featur o the regime. The Germanic fowks (the Nordic race) war conseedert bi the Nazis tae be the purest brainch o the Aryan race an war tharefore viewed as the maister race. Millions o Jews an ither fowks deemed undesirable bi the state war murthert in the Holocaust. Opposeetion tae Hitler's rule wis ruthlessly suppressed. Members o the leeberal, socialist, an communist opposition war killt, impreesoned, or exiled. Christian kirks war oppressed, wi mony leaders impreesoned. Eddication focused on racial biology, population policy, an fitness for militar service. Career an eddicational opportunities for weemen war curtailed. Recreaution an tourism war organised via the Strenth Throu Jey programme, an the 1936 Simmer Olympics shawcased the Third Reich on the internaitional stage. Propaganda meenister Joseph Goebbels made effective uise o film, mass rallies, an Hitler's hypnotic oratory tae influence public opeenion. The govrenment controlled airtistic expression, promotin speceefic airt forms an bannin or discouragin ithers. Beginnin in the late 1930s, Nazi Germany made increasinly aggressive territorial demands, threitenin war if thay war nae met. It seized Austrick an Czechoslovakie in 1938 an 1939. Hitler made a non-aggression pact wi Joseph Stalin an invadit Poland in September 1939, launchin Warld War II in Europe. In alliance wi Italy an smawer Axis pouers, Germany conquered maist o Europe bi 1940 an threitened the UK. 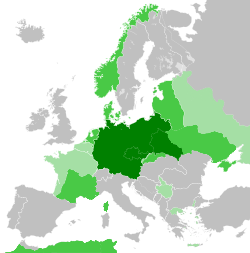 Reichskommissariats teuk control o conquered auries an a German admeenistration wis established in whit wis left o Poland. Jews an ithers deemed undesirable war impreesoned, murthert in Nazi concentration camps an extermination camps, or shot. Follaein the German invasion o the Soviet Union in 1941, the tide gradually turned against the Nazis, that suffered major military defeats in 1943. Lairge-scale aerial bombin o Germany escalatit in 1944 an the Axis pouers war pushed back in Eastren an Soothren Europe. Follaein the Allied invasion o France, Germany wis conquered bi the Soviet Union frae the east an the ither Allied pouers frae the wast an capitulatit within a year. Hitler's refuisal te admit defeat led tae massive destruction o German infrastructur an addeetional war-relatit daiths in the closin months o the war. The veectorious Allies ineetiatit a policy o denazification an put mony o the survivin Nazi leadership on trial for war crimes at the Nuremberg trials. ↑ Includin de facto annexed/incorporatit territories. ↑ The office formally acame vacant on Hitler's daith. His titles war Führer und Reichskanzler frae August 1934. See Gesetz über das Staatsoberhaupt 1934. 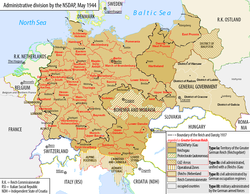 ↑ In 1939, afore Germany acquired control o the last twa regions which had been in its control afore the Versailles Treaty—Alsace-Lorraine, Danzig, an the Pols Corridor—its aurie wis 633,786 square kilometres (244,706 sq mi). See Statistisches Jahrbuch 2006. This page wis last eeditit on 10 November 2018, at 16:51.